At certain time of year grasshoppers become abundant. If you are in luck, a wind will blow these wonderful fish snacks into your favorite waters. It is then a great time to be a fly fisherman. A delicate presentation is not critical then because even big selective trout (largemouth or smallmouth bass, bluegill, etc.) are looking for the tell-tale splat of this helpless terrestrial as it flops into their eating zone. Second, these are big flies and you can use short leaders that are easy to cast. Moreover, even if a hopper has been chewed on a few times, the fish don't seem to mind. Grasshoppers can swim by kicking their hind legs in unison, using the same method as they employ when jumping. 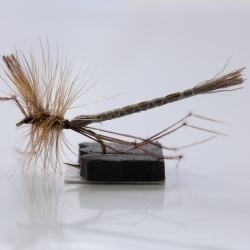 This is simply mimicked by fishing the fly on the surface and retrieving it with short sharp pulls. Continue for about three feet and then let your fly drift for 20 seconds before recommencing the retrieve. This imitates the grasshopper having a rest. Hoppers generally hatch from eggs in June and July and are full grown by mid-August. The adults continue to feed until the first frost. The eggs are laid under ground in late September and October. The best hopper fishing occurs in August and early September. 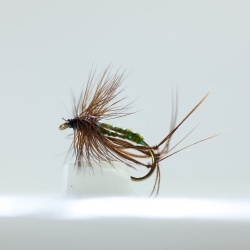 They like hot weather, and you will find your best hopper fishing on hot windy afternoons. 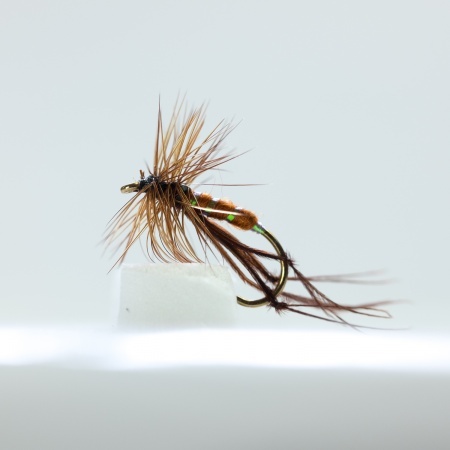 The only downside with hopper patterns is that they don't work all year round but keep some in your fly box just in case. Trout move into shallower riffles downwind from riverbanks near hayfields as the day warms up, on the lookout for helpless struggling grasshoppers locust and crickets. earlier in the day these fish will be hold up in deeper water, along seams. banks and drop offs. Once it gets warmer they return to the areas where they have feasted on these unlucky insects in the past.